3D-printing newbie here. I have a Geeetech's Prusa i3 mk2 B. What riddles me is that the side parts, and the pole's base, print fine; so this does not look like a bad calibrated printer, but something else entirely. My guess is this is some precise tuning I don't know yet. Tuning the e-steps for avoiding over-extrusion. Tuning the z-steps, so the nozzle doesn't melt the last layer when printing a new one. In the same sense, changed the nozzle heat. Tried lots of different layering, speed, walls, bridging, and quirks configurations. So far, the best I got is a little pole not-too-deformed so I can make my part anyway, even when the pole is not well printed. But after seeing lots of videos and reading lots of tips online, I still don't understand how to tune my print for that simple little pole. Other that tips, what I would really like to ask is if somebody has a name for that problem I'm facing, so it would be much more easy to search for my tuning options. So... any clue how to fix this? Basically, you print too hot (and fast) without enough cooling. The deformed small pin in your image is a perfect example of depositing new layers onto too hot (not cooled down enough) prior layers. You can easily solve this by printing two identical parts spaced apart from each other. This allows the layers to cool before the next is deposited. When printing a series of small parts, print them all together. The travel time between the parts is often enough time for the layers to cool without changing your settings. increase part cooling fan percentage (or print a better fan duct that allows for more cooling air to reach the print; many fan ducts are too convergent, the pressure increase is then too big for the fan to effectively push air through it). The other answers have addressed the heat problem. 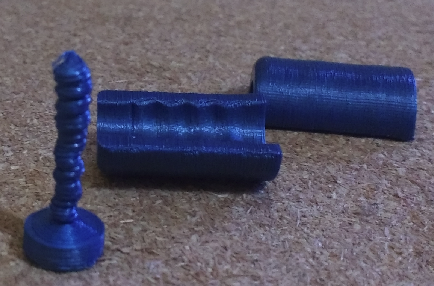 The other risk is that a rod printed vertically like this is prone to snap, because the weakest axis is between layers. I often rotate pieces like this and print with the rod horizontal. You then have to remove the support and/or brim material, and probably do a bit of sanding to get it properly round, but the final part will be much more reliable (not break). Print several. This is the most simple solution and best for beginners. Increase cooling. A better cooling solution or increased fan speed often can help to get thin or delicate objects printed. set minimum layer time to slow down the printer automatically on layers with low cross-sections. If too small, it could pause on the edge of the print, which could leave scorch marks. If you know a little more about your printer and got your retraction dialed in, you can go more advanced: set minimum layer time to 10 to 15 seconds and activate the accompanying Z-hop. This will prevent the scorch marks, but you might need to make sure you don't string. This way the part has a chance to cool down between printing layers. I'm sorry for the long time I took to answer, but the ammount of NEW problems I faced since started this question was so big that wanted to write a list of them before answering my own question. I've finally also desisted from the list, as the problems tends towards infinity. Simple version: printing more than a single item did the trick, as several people proposed here. But then the piece broke when tried to remove it from the hot bed, as somebody else also warned me here. By that time I tried a temp tower, had to recalibrate almost the whole printer, had to also relubricate it, had to learn some tricks about sticking and de-sticking pieces from the bed, tried several different glues, started to fine-tune my slicings, and so on and so on... man, 3D printing is laborious. But I wanted to let this link here for all the fellow newbies out there reading this. That was exactly the kind of document I was looking for online as a newcomer to this world, and I'm sure it will be useful for a lot of people. Not the answer you're looking for? Browse other questions tagged prusa-i3 cura slic3r geeetech or ask your own question. Why are my prints so defective?